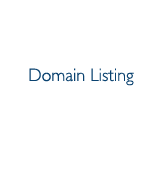 Here's some of the most active domain listings on Flippa right now. Abeq.com || 15 years old VCVC Short & Premium Domain name || Super Brand-able! LoyaltyClick.com - A 14 Years Old Domain Name! No Reserve! TravelDeals.info || Exact Matched domain name for many companies at No Reserve!